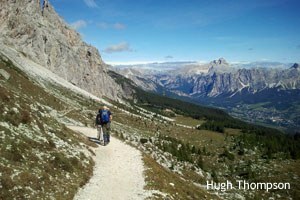 Author and adventurer Hugh Thompson recently strode out on our circuit trek in Italy’s Dolomite Mountains. He was blown away by the dramatic scenery, delicious food and warm welcome waiting for him in the South Tyrol. This mountainous area in northern Italy retains its own unique traditions, history and language. Hugh also discovered the role these soaring mountains played in the First World War.